You may have seen an abundance of apples popping up in grocery stores and farmers’ markets lately, and with good cause: this is the time of year in which these gorgeous globes reach their natural ripeness, and if you’re a fan of them at all, you’ll certainly want to revel in the many varieties available. From crisp Granny Smith to lusciously sweet Honeycrisp, there’s an apple out there just for you. 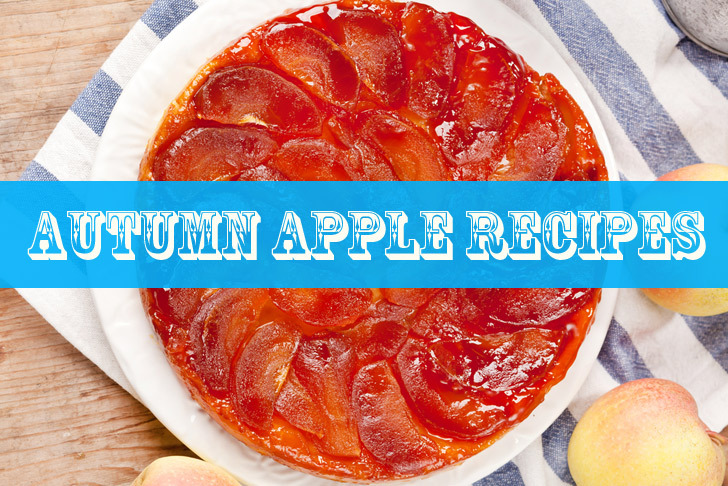 And we have some fabulous recipes to share that will allow you to put them to good use. Instead of the classic apple pie standby, consider this variation, in which a pie is baked upside-down and then flipped over to reveal a beautiful pattern of caramelized apple slices. Preheat your oven to 425F, then grease a 9-inch pie pan with the butter/Earth Balance, and do so generously. Then take your sugar and sprinkle it evenly all over the buttered surface. Arrange your apple wedges upright in a pattern that you like, making sure that you wedge them in tightly—you may have to cut some into smaller pieces to ensure that there are no gaps. Sprinkle the apples with a bit of cinnamon. Roll out your puff pastry or pie shell onto a floured surface and then lay it atop your apple-filled pie dish. If you’re using a frozen pie crust, just make sure it’s fully thawed, and then pop that onto the dish. Roll around the edges with your rolling pin and trim the edges as needed. Bake for about 20-25 minutes, until the pastry has turned golden brown, and then remove from the oven. 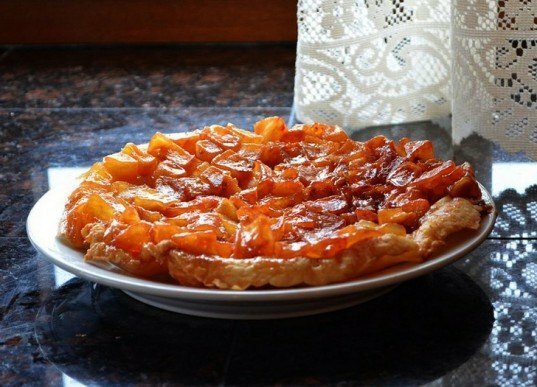 Let sit for 5-10 minutes, and then invert it: place a plate or serving dish that’s larger than the pie dish on top of the tatin, and then flip it over. The tart should slip out of the pie dish and plunk itself beautifully onto the plate. Be sure to use oven mitts when you do this or you’ll burn your hands. Serve with crème fraîche, whipped coconut cream, or a scoop of your favorite frozen vanilla ice cream (vegan or non). Caramel apples are the mainstays of autumn celebrations and carnival cuisine everywhere, but you don’t have to dedicate yourself to scarfing an entire apple in one sitting: just use that melon scoop to carve out perfect little balls of apple flesh, and then dip them into caramel sauce. Most store-bought caramels are either full of dairy or gluten, so if you avoid those, you might wish to make your own sauce. Combine all the ingredients in a food processor and blend for several minutes until well combined. Adjust the salt level if you think it’s needed. The ingredients should meld together in the food processor to create a gooey caramel, but if you find that they’re not melting properly, you can microwave the mixture or put it in a double boiler for a short time until it goo-ifies. 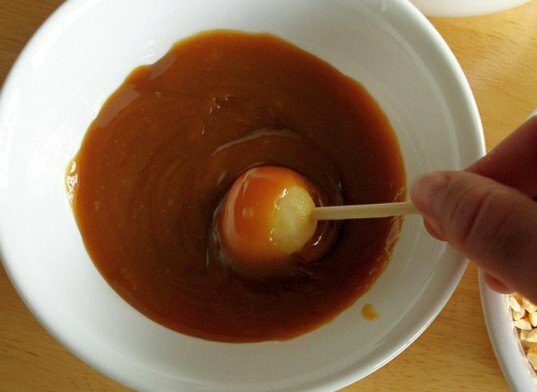 Grab some skewers and jab one into each apple ball, then roll it around in the caramel sauce until it’s well coated. You can either eat them immediately, let them set in the fridge to be served later, or roll them into crushed toppings like smashed rice cereal, pecan bits, toasted almond crumbs, chocolate sprinkles, etc. Bright and refreshing, this is a great salad to add to a brunch menu, or to take along to work or school as a light, nourishing lunch. For a vegan version, skip the feta and go for Daiya shreds or savory cashew “cheese”. Combine all ingredients into a large bowl, and toss well. Drizzle with olive oil to taste (I probably use 2 tablespoons, but others may prefer more/less/none). Add feta cheese and toss until all combined. Season with salt and pepper to taste, and serve chilled. To make this a heartier dish, you can add 1.5 cups of cooked quinoa or couscous to it and adjust the seasonings accordingly. 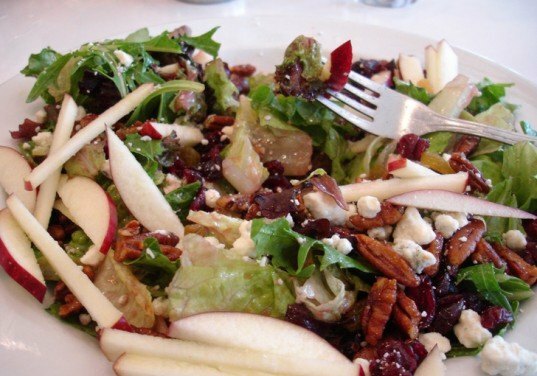 This is also lovely when tossed with mixed greens like baby spinach and arugula, and you can add extra nuts for additional protein and crunch. I like to add toasted sunflower seeds, some alfalfa sprouts, and sometimes even sliced olives. Preserving the harvest really is part of the fall season, and if you spend a weekend canning some spiced apple wedges, you’ll be able to enjoy their sweet, summery flavors all winter long. These can be processed in a hot water bath, but be sure to follow proper canning procedures to ensure that no contaminants find their way into your jars. After sterilizing them, keep your jars, lids, and bands in hot water until you’re ready to use them. Wash, core, and peel apples, then cut lengthwise into eighths. Sprinkle with lemon juice to prevent them from browning, and set aside. Combine the remaining ingredients in a large saucepan and bring to a boil, slowly. Drain your apple wedges and add them to the liquid mixture, then cover and simmer for 5 minutes. 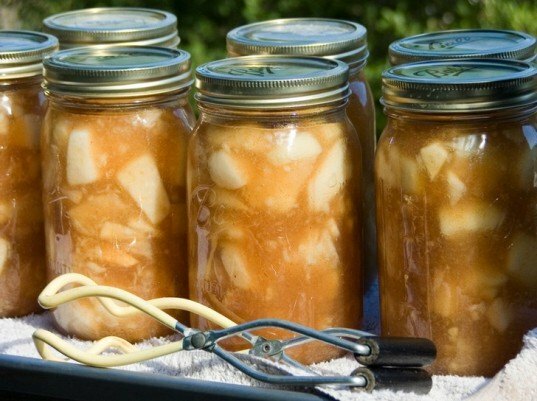 Use a slotted spoon to pull the simmered apples out of the mixture and pack them into the sterilized, pre-warmed jars, leaving 1/2 an inch of headspace. Then, use a ladle to pour the syrup over the apples, covering them, but keeping that 1/2 inch headspace. Remove any bubbles with a plastic spoon handle or bubble remover, clean the rim, apply and adjust the lid and cap, and then process for 20 minutes in a boiling water canner. Enjoy the gorgeous bounty of this autumn season, and remember that these dishes are always best when shared with fabulous friends!